I knew this was a winner when J. began referring to it as “The Crack.” It’s actually very simple to make, so it’s a perfect thing to have in your arsenal when you want to pull together an easy but decadent gift or treat for someone special. Since I’m a Crunchy Hippie Intellectual, I had organic brown rice krispie-style cereal in my cupboard, and that’s what I used; but you’ll use whatever you like. Line a baking sheet with a sheet of parchment paper and grease the parchment well. In a double boiler, melt the chocolate chips and butter together until smooth. Add 2 tablespoons of the cream and stir until the ganache is silky and glossy. Remove from the heat and add the vanilla extract. Mix well. Pour the chocolate ganache out onto the prepared parchment, spreading it evenly to cover the sheet pan, leaving a 1-to-2-inch border. Sprinkle the rice krispie cereal over the chocolate, until the whole surface is covered. Refrigerate the candy for at least 1 hour, to cool the chocolate and begin setting it. In a medium saucepan, combine the cane sugar, sea salt, and water. Cook over medium-high heat, swirling the pan frequently (DO NOT STIR), until the sugar has melted and turned a dark amber color. Watch it carefully — don’t walk away! It will probably take between 5 and 7 minutes total. Quickly pour in the remaining 4 tablespoons of cream. It will bubble up violently — don’t be concerned. At this point, you can stir with a wooden spoon or silicon spatula. Stir gently and continue cooking for an additional 2-3 minutes, until the caramel has thickened and pours in a thin ribbon from the spoon. 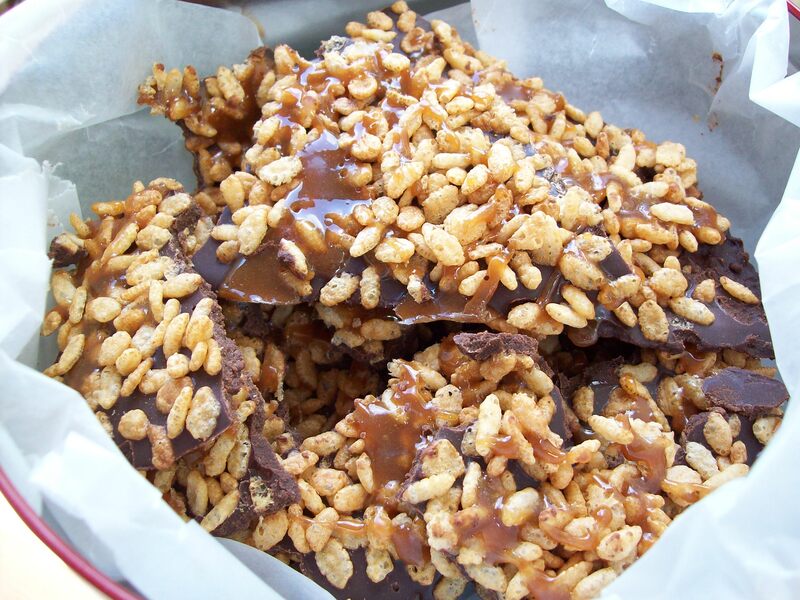 Drizzle the caramel liberally over the surface of the rice krispies. Return the pan to the refrigerator and allow the candy to set overnight. Once it’s completely cooled and set, peel the parchment away and break the candy into rough pieces for serving.